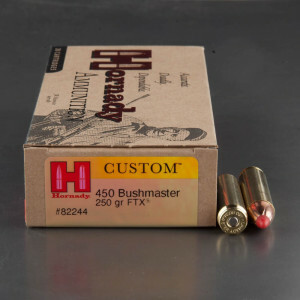 450 Bushmaster ammunition is one caliber in a recent line of big bore AR 15 cartridges designed for military and law enforcement. The quest for a powerful, one hit fight stopper that’s acceptable for close quarters battle resulted in a number of different calibers coming forward in AR platforms. The 450 Bushmaster was designed by Tim LeGrende of LeMag Firearms. The 450 Bushmaster was licensed by Bushmaster and they produce the upper receivers, complete weapons, and magazines for the cartridge. 450 Bushmaster ammo fires a 260-grain bullet at an impressive 2,100 feet per second. This delivers a massive amount of energy transfer and is incredibly powerful. However, the round is limited in capacity and range. A standard 30-round AR mag requires a specialized follower, and can contain 9 rounds of 450 Bushmaster. The effective range is most often within 200 yards and is a perfect brush cartridge.